I am so glad to see this product at pure formulas. The best price I can find. Much cheaper than my other source. I am having a good experience with this Great Plains® Bentonite Detox by Yerba Prima product. I am feeling much better already! I received my order in a short period of time, less than one week. Well packaged with my invoice included. The product was what I had ordered with no obvious tampering. Detoxify your digestive tract and strengthen immunity with Great Plains® Bentonite Detox – 16 fl. 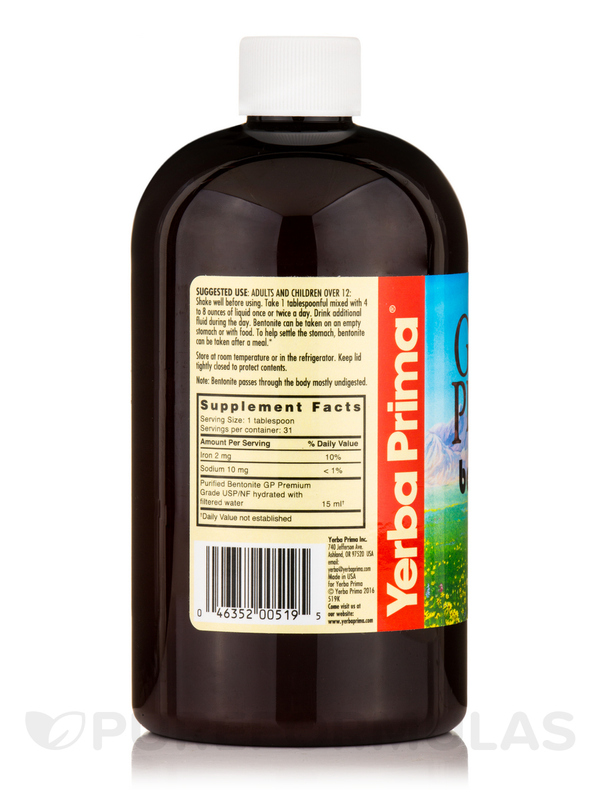 oz (473 ml) from Yerba Prima®. The high absorbent action of this dietary supplement may bind harmful substances in your body and remove them through bowel movements. Bentonite clay reportedly has strong drawing and healing properties. It could potentially eliminate impurities and toxins out of your body to ward off associated conditions. Studies reveal that bentonite clay alkalizes your body and removes intestinal parasites from the intestinal tract. 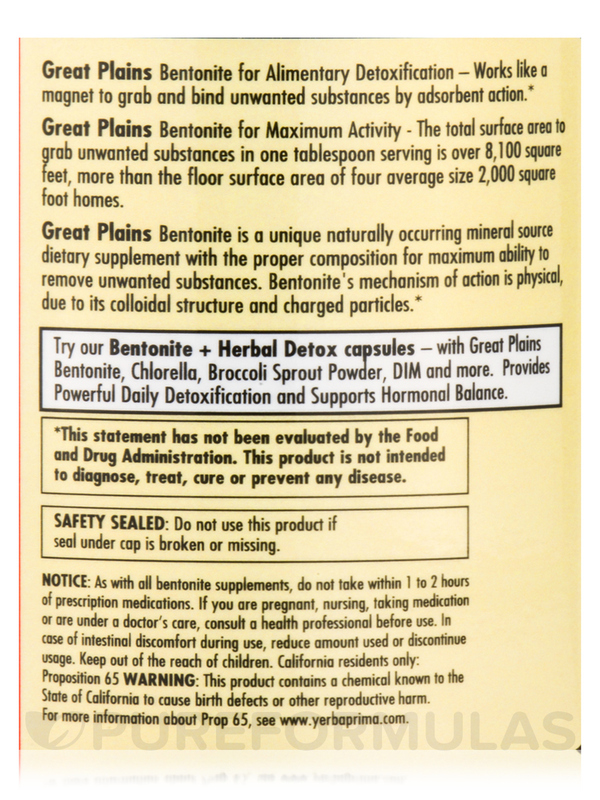 Bentonite GP premium in this dietary supplement from Yerba Prima® could potentially bind toxins present in your stomach‚ colon‚ and small intestine and eliminate them from your body. It may also eliminate chemicals and heavy metals from your abdomen to ease digestive distress. Reports suggest that bentonite promotes beneficial bacteria in your gut‚ boosts cognition‚ supports a healthy mood‚ and prevents the growth of harmful cells in your body. Incorporate Great Plains® Bentonite Detox – 16 fl. 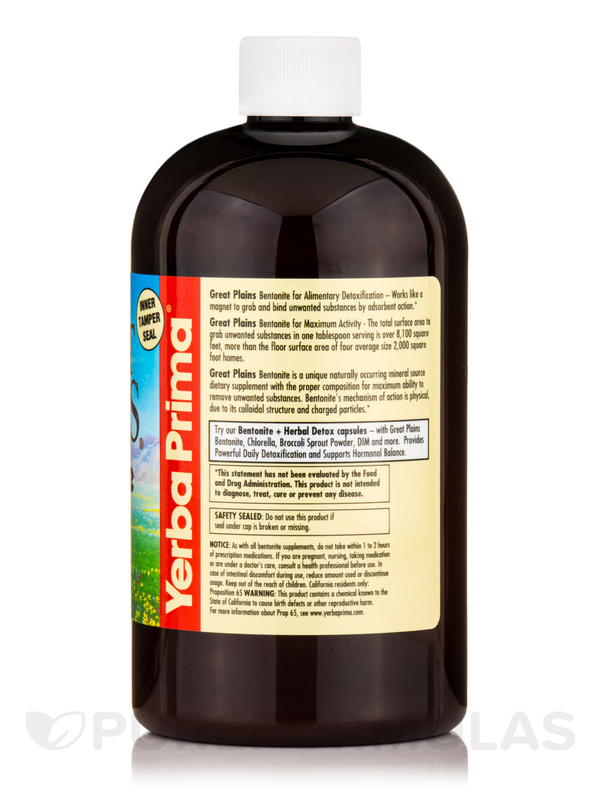 oz (473 ml) from Yerba Prima® in your daily diet and it may relieve digestive conditions‚ detoxify your body‚ and boost energy levels too. Adults and Children over 12: Shake well before using. Take 1 tablespoonful mixed with 4 to 8 ounces of liquid once or twice a day. Drink additional fluid during the day. Bentonite can be taken on an empty stomach or with food. 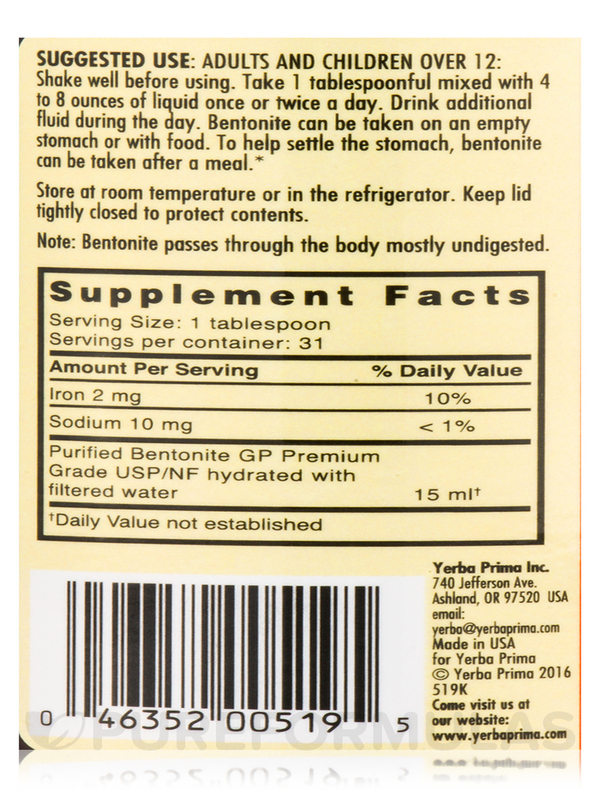 To help settle the stomach‚ bentonite can be taken after a meal. As with all bentonite supplements‚ do not take within 1 or 2 hours of prescription medications. If you are pregnant‚ nursing‚ taking medication or are under a doctor's care‚ consult a health professional before use. In case of intestinal discomfort during use‚ reduce amount used or discontinue usage. Safety Sealed: Do not use this product if seal under cap is broken or missing. Keep lid tightly closed to protect contents. One of my sister's dogs gets diarrhea fairly often when she gets fed too much. Great Plains Bentonite Detox by Yerba Prima helps a lot. Proven ingredients to detox our bodies of all the nasty things in our environment. 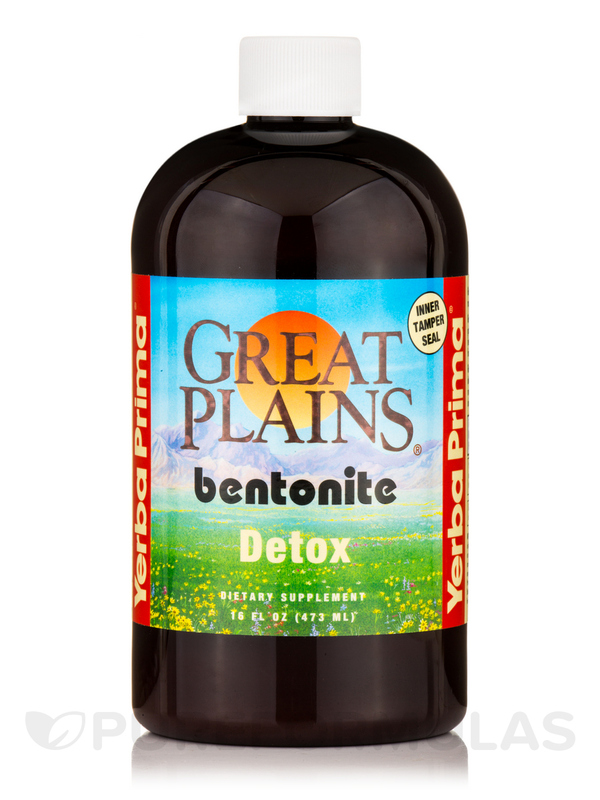 Use Great Plains Bentonite Detox by Yerba Prima for intermittent fasting as well as detoxing. Add with psyllium husk to create a 'drink' while fasting. Not a powder, but a concentrated liquid. I had digestive issues and the Psyllium and Great Plains Bentonite Detox by Yerba Prima shakes helped greatly. Cheaper than anywhere else too. I love Great Plains Bentonite Detox by Yerba Prima. It helps with my stomach issues and my breath is freshier. I use to drink pure bentonite clay every day but had to mix it with water and was a much longer process. With this product the mixing is done and just a little water is needed. Great Plains Bentonite Detox by Yerba Prima is a natural product that helps me to clean my system. No dislikes & I would re-order. I purchased your bentonite detox for the first time. After taking it on an empty stomache, how long should I wait before eating? Thx. Hello, thank you for contacting PureFormulas. I advise for you to contact the manufacturer directly since they do not specify on ther bottle.